Cryptoanarchy Discussions Liberty.meWhy I claim that only Cryptoanarchists have the tools we all need. Cryptoanarchists are the only liberty lovers with the tools to do something about our situation. Why I claim that only Cryptoanarchists have the tools we all need. You can’t change a person’s religion by burning down their church. The same goes for their political philosophy; especially their belief in statism as a whole. Clearly, violent measures aren’t going to sway the statist world over to anarchy. Further, strong words can’t do the job of converting humanity away from statism either… More people are born every minute than we can free from their indoctrination all year! Simply teaching people like we have been doing since Bastiat is a losing game. So what does work? How can anarchy prevail one day? By setting up systems that GIVE PEOPLE stuff they value… Bribing humanity, basically. You can do that on a planetary level and get a response. Just give everyone stuff that they cannot get from the state, or at least not for free. No, I’m not suggesting that cryptoanarchists will pass a hat around and take up a collection to bribe statists with directly… This is where the system comes in. Bittorrent and Bitcoin are two excellent examples of cryptoanarchy giving everyone things they do not get from the state. They are Agorism set to code. These two apps cannot be stopped; they bring their own bubble of free market with them wherever they go. Cryptoanarchists can destroy statism simply by making more and more of these apps. An app for everything that governments do today; from money to law enforcement to charity to even the frickin’ roads… If the state can do it with bureaucracy, we can make an app to do it with efficiency & no central points to attack at all. Once the whole world has free or better alternatives already to everything they are offered by the governments, what’s the point in paying their taxes anymore? I like the way you’re thinking. Bitcoin helps us make the world more cooperative, without having to persuade each user of a lot of philosophy. Just convince them it’s easier than dealing with banks and credit cards. Is that cryptoagorism? I want more. On the other hand, people can find substitutes for most government “services” already. That doesn’t touch the source of government’s supposed necessity and legitimacy in the mind of an ordinary person. How many of the people who make their living in the black market embrace libertarianism? Their livelihoods depend on the fact that they disobey, yet they mostly choose not to challenge the legitimacy of the system that condemns them. They still believe the cover story, and Bitcoin won’t change that. What sort of software can we write that will make them notice that man behind the curtain? What sort of software can we write that will make them notice that man behind the curtain? I believe that bitcoin itself was the most imporant single software to accomplish this, but it’s going to be one of many… To really show the masses that they don’t need government we’ve literally got to give them better alternatives to every single service they rely on government for. But who will feed the poor? But who will stop that bad guys? If the govs of the world want to step in the way and make it hard/illegal for consumers to contact these businesses, it would be pretty simple for some cryptoanarchist to make a P2P shell interface to search for and do buisiness with them thru. On the other other hand, Chinese escaping from the mainland to Hong Kong during the sixties didn’t necessarily understand or embrace the ideological differences. I guess some of them decided they had been lied to, and some of them just wanted to go make some money. Bitcoin is our virtual Hong Kong? I agree that services like Bitcoin (and email for that matter) are probably the best tool we have for demonstrating to the average person that anything government does can be done better. There are two main problems I see with tying it all to cryptoanarchy, though – first, that while software systems work great for services like messaging and money where you really just need to transfer information from one person to another, I’m not sure how they’d apply to security or roads. Second, that government would almost certainly crack down on services that infringed on their monopolies in those areas, unless, like bitcoin, they were distributed somehow. It still remains to be seen how they’ll handle bitcoin in the long run, too. I’m can’t see how you could use software to provide alternatives for security or road building – things that need to enact physical changes in the world, in other words. Have you heard of porc411? Software and communications can support communities AFK as well as online. The problem is, we need members of the community to be close enough to each other for things like this to be practical. Liberty lovers are outnumbered and spread out. Okay, I can’t write a program to fix that! Communications, for sure. I can definitely see applications for software for connecting supplies with demands, like Uber does for transportation. Smart contracts could make something like building a road much simpler – you could get anyone who owns property where you want to build to sign on to a smart contract that says “if everyone else in this group of affected people all agree as well, then I’d agree to sell my home for $X” – sort of a distributed kickstarter-style contract. So I guess I see ways where software can make significant inroads, but obviously at some point you’re going to have to go to the “physical layer”. One way or another, I’m fascinated to see where we as a community go with this stuff, and how governments react as it grows. Providing Cryptoanarchic software alternatives to physical needs like roads and security is of course going to be too difficult at first to consider… Bitcoin and the blockchain-based legal system need to take off first in order to weaken the state enough before someone actually tries to build a major road without the state’s say-so. Of course there will be all kinds of overlap and exceptions, but in general, if we build up our alternatives for government in this order, then the state will be weakend enough by the later steps to put up much of a fight, because of the damage caused by the earlier steps… Especially by the time enough people are using bitcoin that taxes start to wither away. 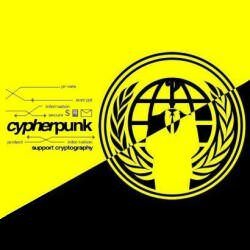 I agree that crytoanarchists are awesome and that much of the future of, and hope for, liberty lies in their hands. As to who would build the roads or how to provide security, an easy thing that CAN be done through P2P and cryptographic software is the dissemination of information about people who are willing to provide the service. Take for instance the application a group of people are working on to create a P2P ride sharing program (they won the BitAngels hackathon in Austin, I believe). You might say, but how can cryptography provide a solution to real-world problems like the taxi cartels, with all their municipally guarded licensing racket? Well, here’s a way. Basically let people know how to organize around an idea and how anyone can contribute to (and derive benefit from) a distributed autonomous company. I really like the idea, and I think that technology is our best chance for expanding the scope of liberty in the future. As some people above have said, there are going to be difficulties to overcome, some of which will be more challenging than others. There are some people that simply cannot divorce themselves from the idea that there are certain things that only government can provide, and there are others seeking to use the power of government to build their own cartels. Despite those challenges, I wish that I had greater technical skills, as I would love to be one of those people developing the next generation of technologies to enhance freedom.